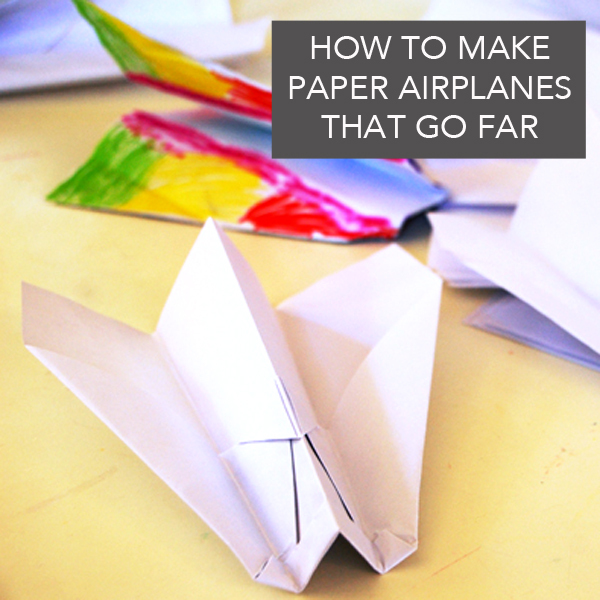 We love engineering projects and my kids make their fair share of paper airplanes. 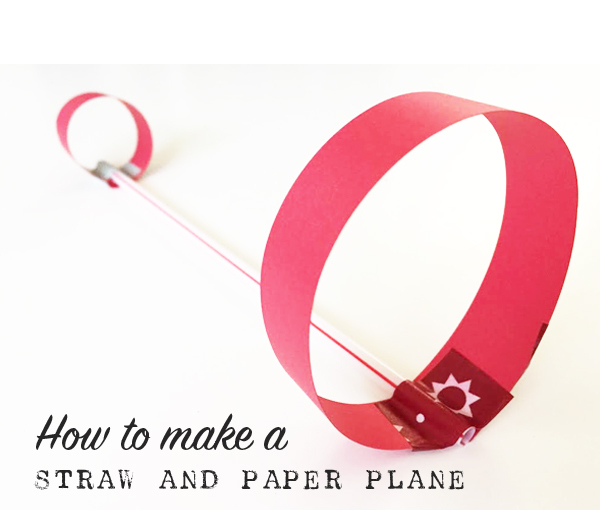 This is a fun twist on the paper airplane, and I’ll show you how to make straw and paper airplanes. I was amazed at just how far this simple contraption could go! 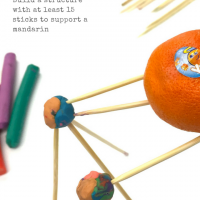 I’ve been wanting to make one of these for a while, and then along came Asia Citro’s newest book, The Curious Kids’ Science Book: 100+ Creative Hands-on Activities for Ages 4-8. (affiliate). 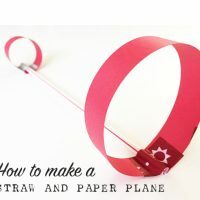 And wouldn’t you know, right there on page 123 is a project called Design a Straw Plane and Change the Parts to Change how it Flies. 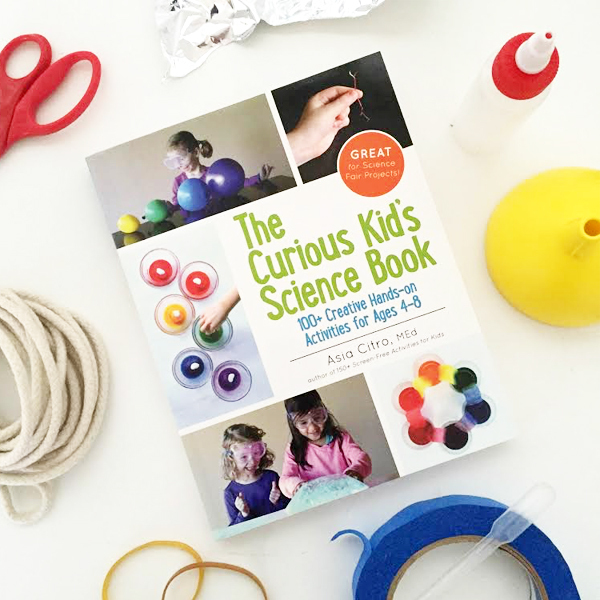 If you enjoyed my book or have a curious and creative child between the ages of 4 and 8, The Curious Kids’ Science Book is just for you. 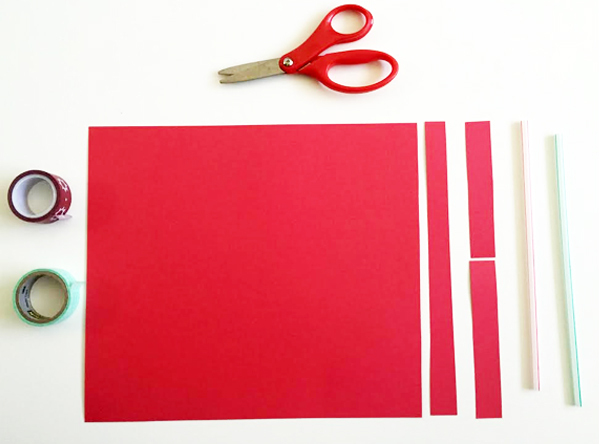 Cut two strips off the end off a sheet of paper that are approximately 1″ wide. You will now use two pieces of paper: The long one and one of the short ones. Ours measured at roughly 1″ x 8.5″ and 1″ x 4.25″. This does not have to be precise. 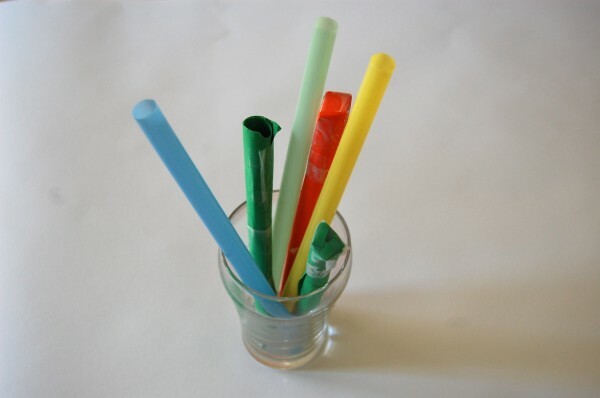 Tape the loops to either end of a straw, making sure that they are facing the same direction. 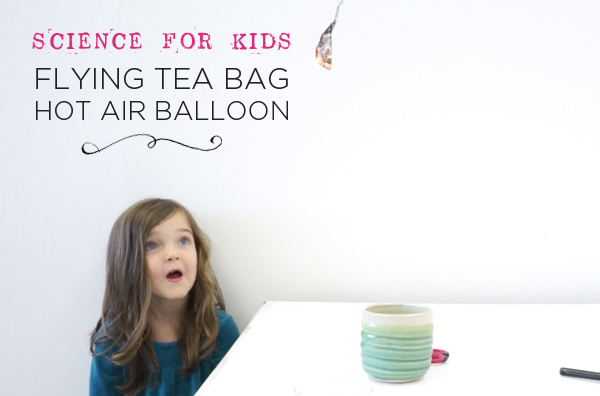 If you enjoy making things that fly, try making a flying teabag hot air balloon. 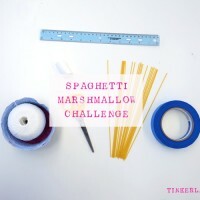 Do you know about the Spaghetti Tower Marshmallow Challenge? 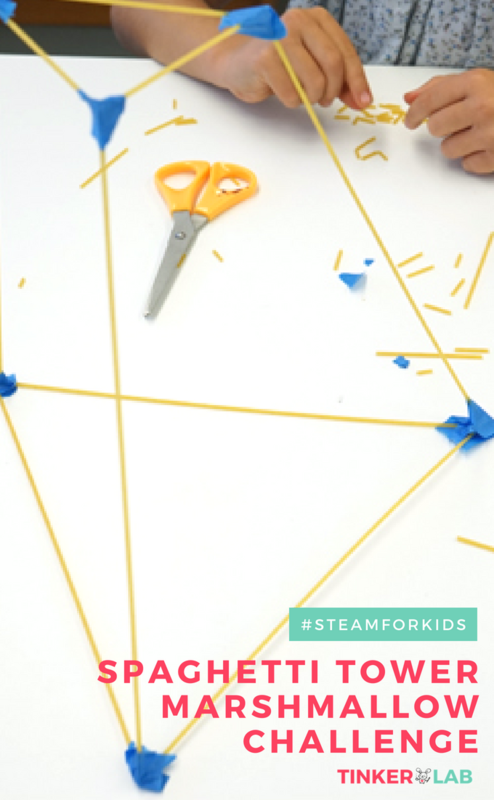 Set up a Spaghetti Marshmallow Challenge with young children to explore the design process: thinking, doing, prototyping, and iteration: a great STEAM challenge. 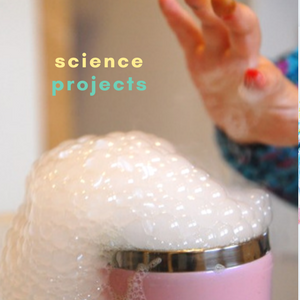 If you have any marshmallows left over from the Microwave Marshmallow Experiment, this is the project for you! This is one of those legendary team-building challenges that I’ve been hearing about for ages and have never tried. 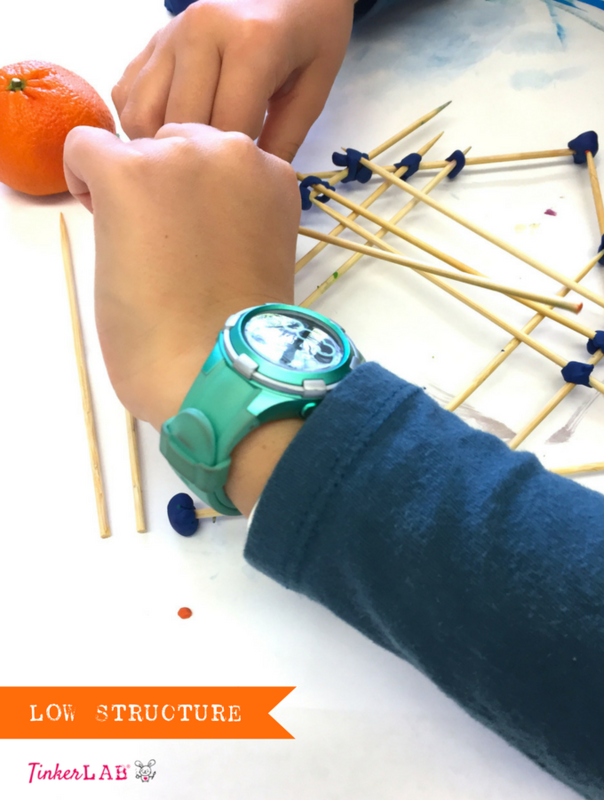 It encourages the design mindset and supports basic engineering principles. 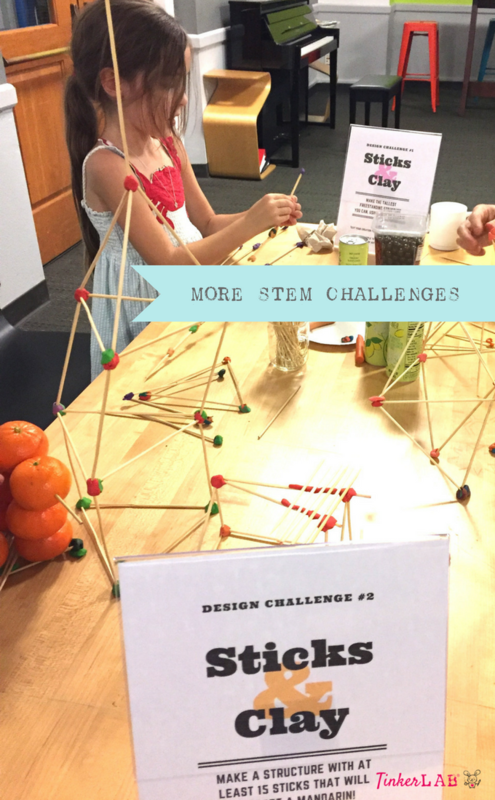 The basic idea is that a team is given a handful of supplies to work with — spaghetti, tape, and string — and given 18 minutes to build the tallest possible tower that can SUPPORT a marshmallow. And the point of it? The team will practice the design process that includes thinking, doing, prototyping, and iteration. This last point, iteration, may be the most important. Watch the video at the end of this post for more on that. Oh, and what group historically performs the BEST in the marshmallow challenge? The answer to that question is also in the video, and you will LOVE it. 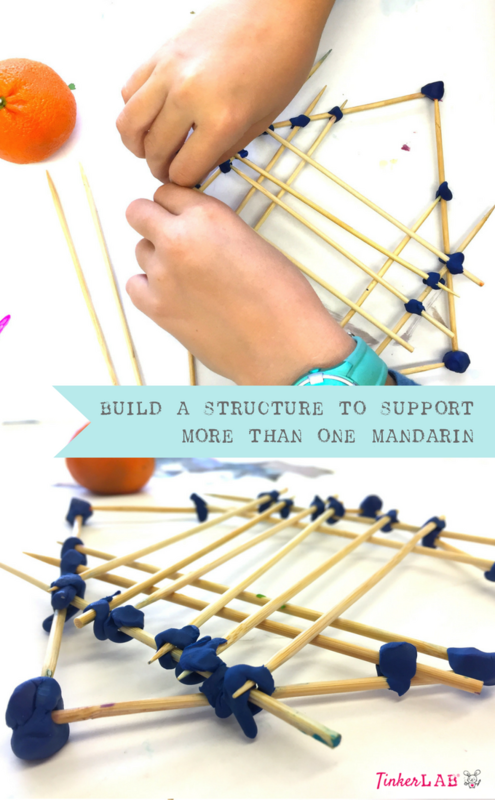 If you enjoy this project, you’ll also like this STEAM Design Challenge to suport a mandarin with sticks and clay. Challenge: To build the tallest tower possible in 18 minutes that will support the marshmallow. 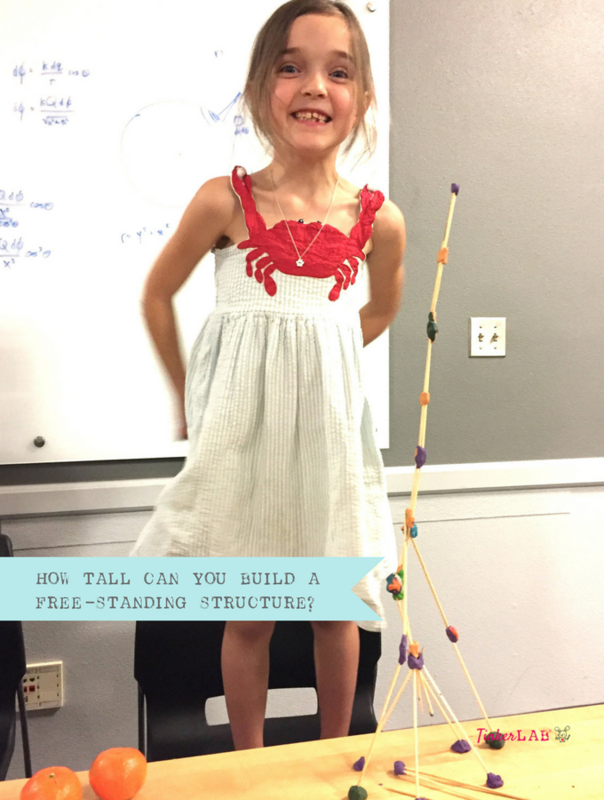 Explain the challenge: Build the tallest tower possible that will support a marshmallow, in 18 minutes. My two daughters, ages 4 and 6, and I set our timer for 18 minutes, and started to build. It was exciting, frustrating (spaghetti is nimble and brittle! ), and fun. My little one lost interest quickly, but my older daughter stuck with it, pushing me with her novel ideas and keeping me going, right up until the timer ran out. We talked about how triangles build strong structures, so we started there. 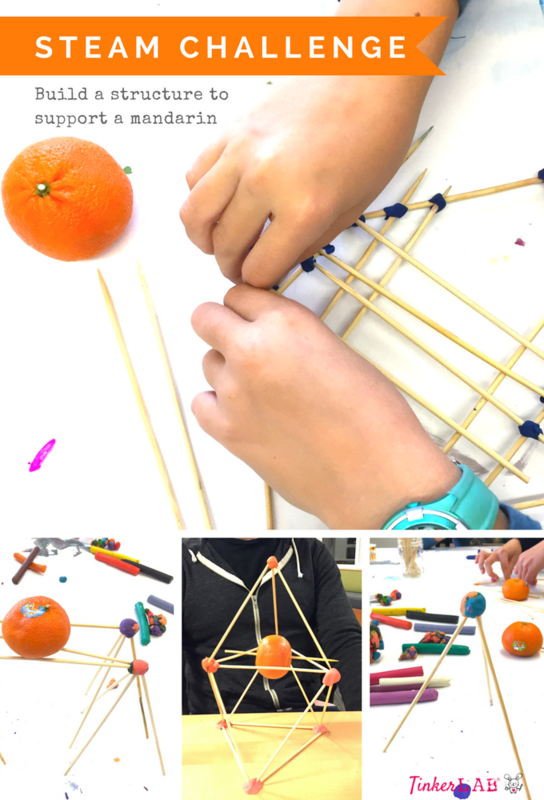 Our original idea was to build two structures – one that could support the other, to make our tower twice as tall. As we got towards the end of our time, the bottom towner couldn’t support the weight of the second tower, so we chose just one of the towers to use as a support for the marshmallow. In the end, we measured our marshmallow’s height and it clocked in at 10.5 inches. 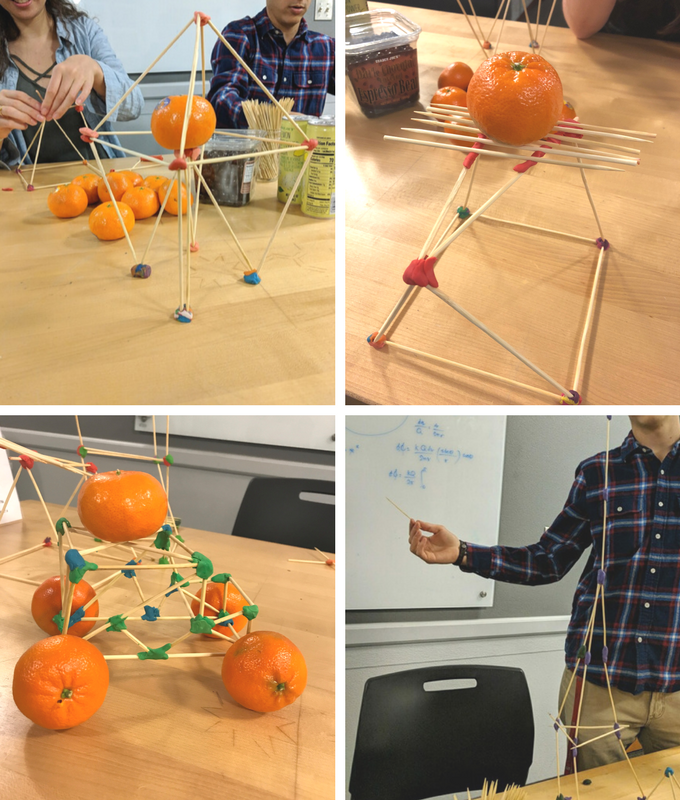 Not earth-shattering, but at least we had a supporting structure! I love my daughter’s idea to suspend the marshmallow from a string! 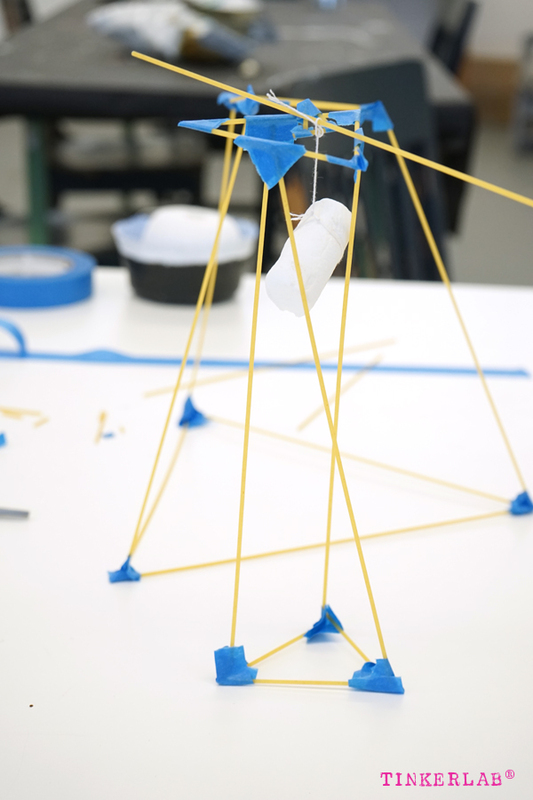 You’ll want to watch this video of Tom Wujec’s TED talk on the Marshmallow Challenge. 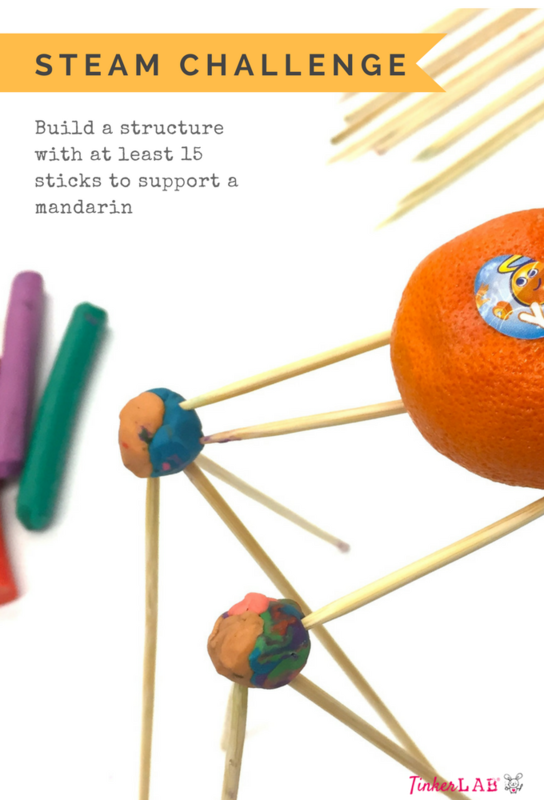 I would love to try this out with our Girl Scout troop or with my older daughter’s friends. After watching Wujec’s video (above), I’m eager to see this in action with a group of young children. Got Pasta? 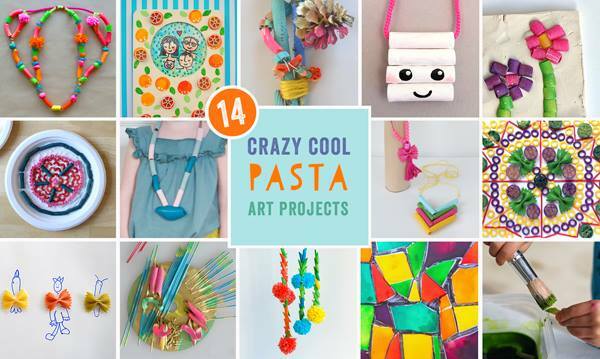 Here are more projects for kids that use pasta. 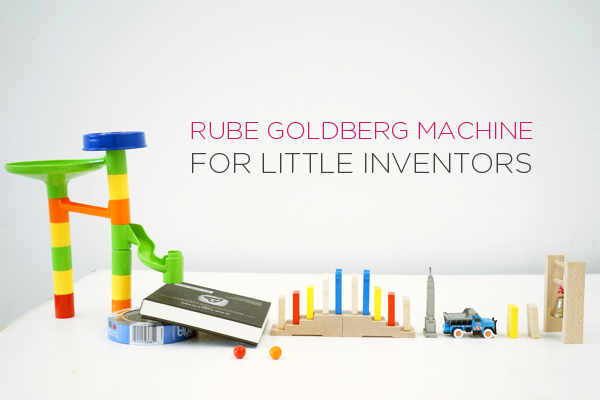 So, are you interested in building a Rube Goldberg-style machine with little kids? This post will give you a few tips and ideas to make your own complicated machine. 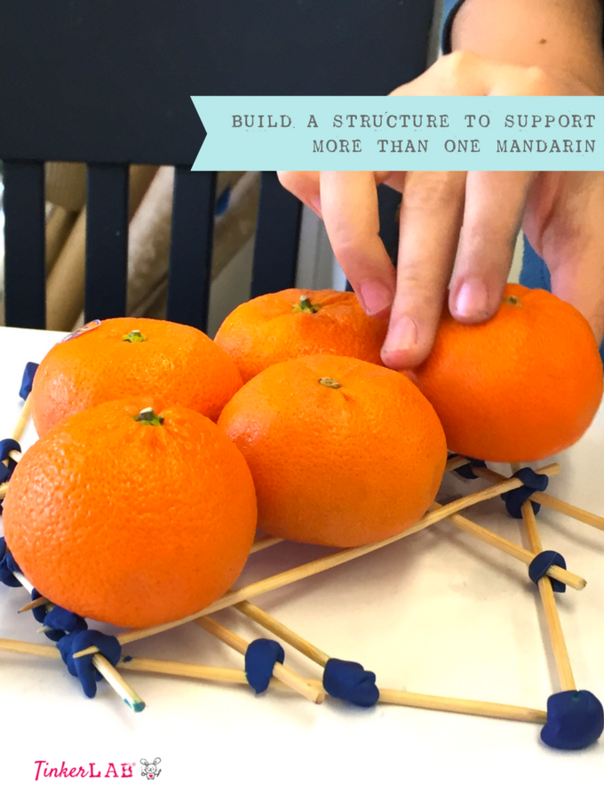 This project has long been on my to-do list with my kids. 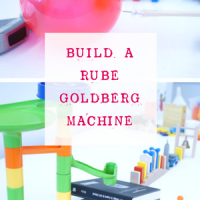 We are long-time fans of marble runs (see the resources page for recommendations), and extending our love for rolling balls and ramps into the world of Rube Goldberg was a no-brainer. 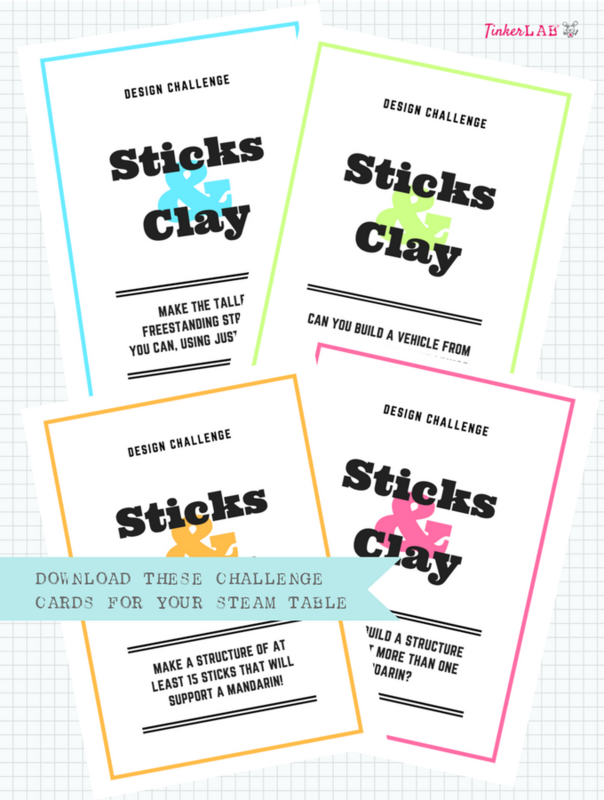 And triple hurrah for projects that celebrate STEM and STEAM learning. 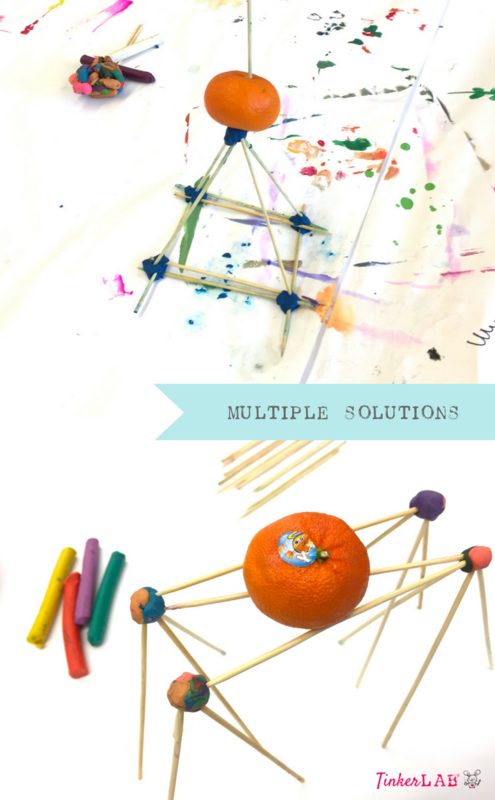 We were on the hunt for easy Rube Goldberg ideas, watched a few videos, and came up with this fun solution that works for young children. For the uninitiated, Rube Goldberg was an American Pulitzer Prize winning cartoonist, sculptor, author, engineer, and inventor, and his work is a classic example of the melding of art and science. Goldberg began his career as an engineer, and later became a cartoonist who drew elaborate illustrations of contraptions made up of pulleys, cups, birds, balloons, and watering cans that were designed to solve a simple task such as opening a window or setting an alarm clock. Interestingly, Goldberg only drew the pictures, and never built any of his inventions. However, these pictures have since served as inspiration for makers and builders who want the challenge of making wild inventions to solve everyday problems. And apparently, Rube Goldberg is a now an adjective in the dictionary! You can read more about Goldberg here. 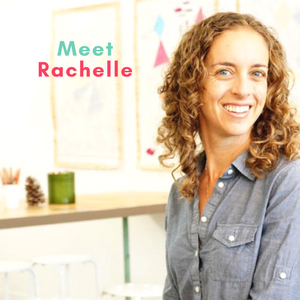 First things first, you’ll want to watch some Rube Goldberg contraptions in action to get inspired. My kids and I LOVE this video from OK Go. It’s incredible complicated, but oh-so-amazing, so don’t think for one hot second that you’ll be able to replicate this with little kids. You can print out the following list here. Balls: Tennis, Baseball, Bowling, etc. Step 4: Build Your Machine! Once you have the supplies ready, start building. 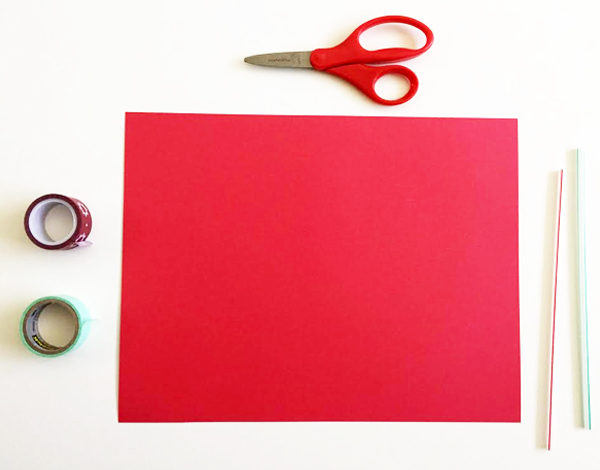 While the OK Go video (and others like it) includes some pretty complex machines and concepts, keep this simple for preschoolers. The basic concept that we’re exploring is that of a chain reaction, so anything that tips something else over (and so one) is what you’re going for. Don’t worry too much about building things like pulleys and levers for young children. Take a look at our machine to get a sense of what’s possible. Success breeds enthusiasm, so keep the steps to a minimum. You can always add more as you go. As you test and try out different set-ups, you’ll undoubtedly fail a few times. I could have filled a 20 minute video with outtakes from all our misses (the balloon is a good example of that). But this is great news! Failure is an intrinsic piece of the invention process, and without these mistakes we won’t learn how things really work. So embrace failure and celebrate it as part of the learning process. Ask: What other simple problems could we solve? 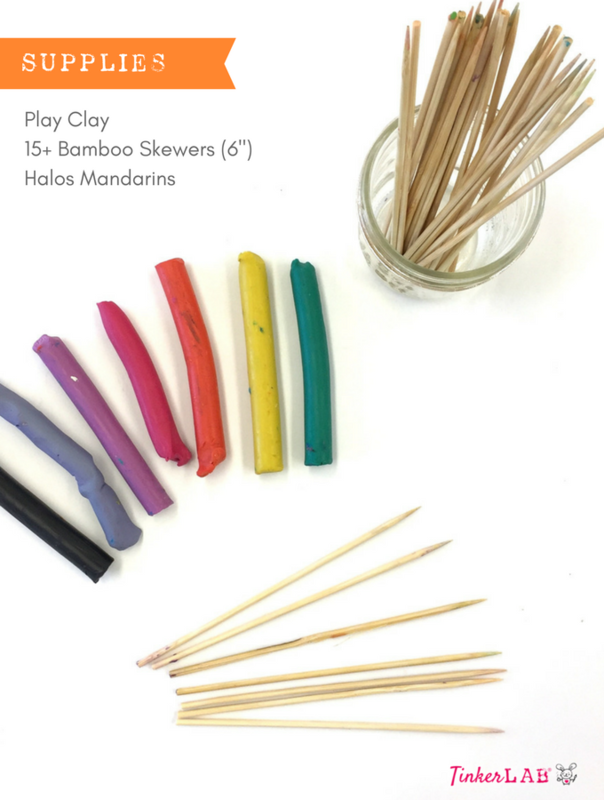 Ask: What materials could we use? Ask: Why didn’t that work? How could we fix it or try it again? 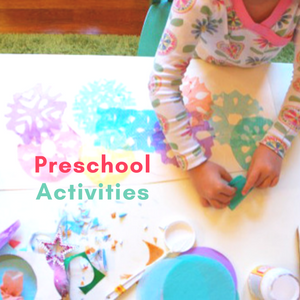 Encourage your child to problem solve by seeking out materials and moving objects. Did you enjoy this project? 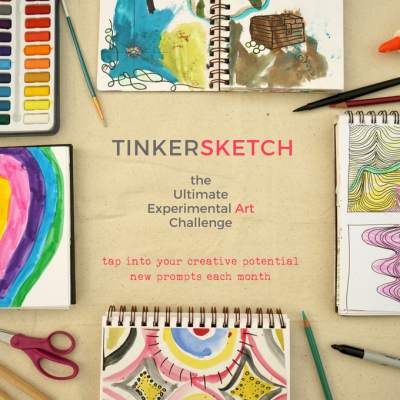 Join the semi-secret Club TinkerLab on Facebook to swap and share more ideas like this. Zoom Ball | What Do We Do All Day? Kids love to hide in cubbies, caves, dens, and forts, and today I’m sharing 6 Fort Building Ideas to get your little builders inspired. 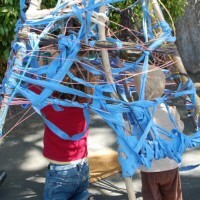 In case you’re just checking in, I’m sharing some of my favorite kid-related ideas from the Bay Area Maker Faire, and today I’d like to share two creative ideas for building forts. These aren’t your quick and simple throw-a-sheet-over-the-dining-table sort of forts. These actually take some time. But the pay-off may be worth it. I’d love to hear your thoughts on this. 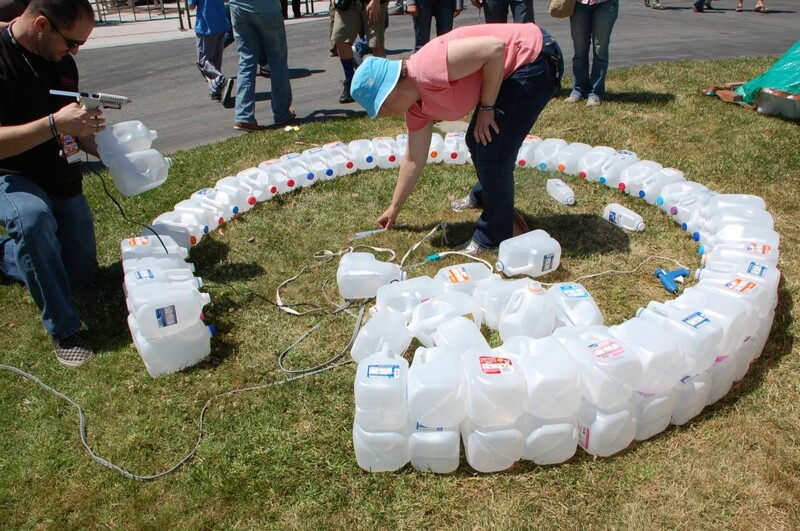 I met up with second grade teacher Katy Arrillaga, who was busy assembling a milk jug igloo. 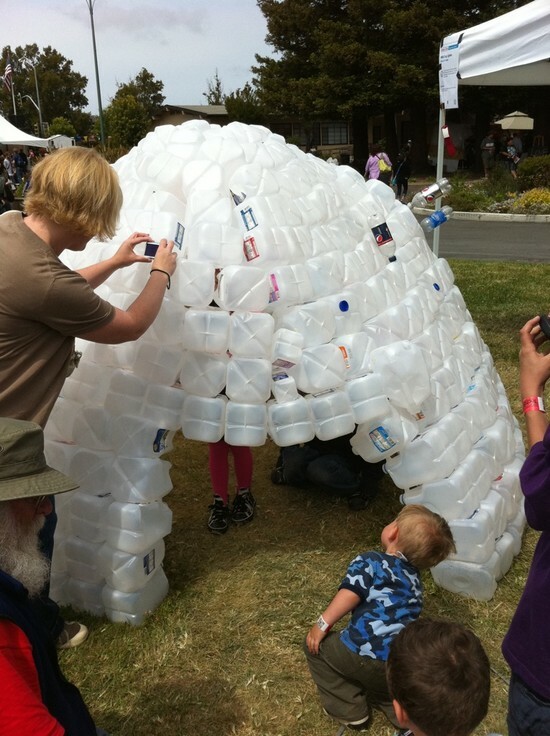 Or, I should say, “reassembling,” because she deconstructed the igloo that stood in her classroom, somehow managed to cart 400 milk jugs to the Maker Faire, and proceeded to reattach the bottles together. Katy explained that this was a popular reading area in her classroom and the jugs were mostly donated by her students. This is how it looked about an hour later, moving along more quickly with all of those hot-glue-gun helpers. This picture was taken the next day. I’m not sure how long it took to complete, but the result is stunning and children flocked to this. There’s something magical about seeing so many familiar jugs on such a scale. This picture was taken about a month ago when we visited the Dougherty sculpture. The scale is striking. 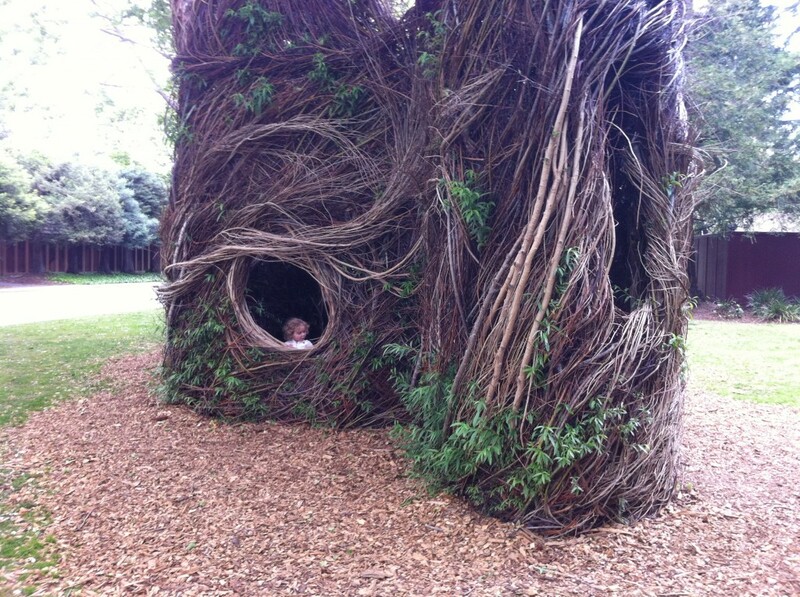 My daughter loved it, and spent about an hour playing in and out of this hobbit-like hidey hole. 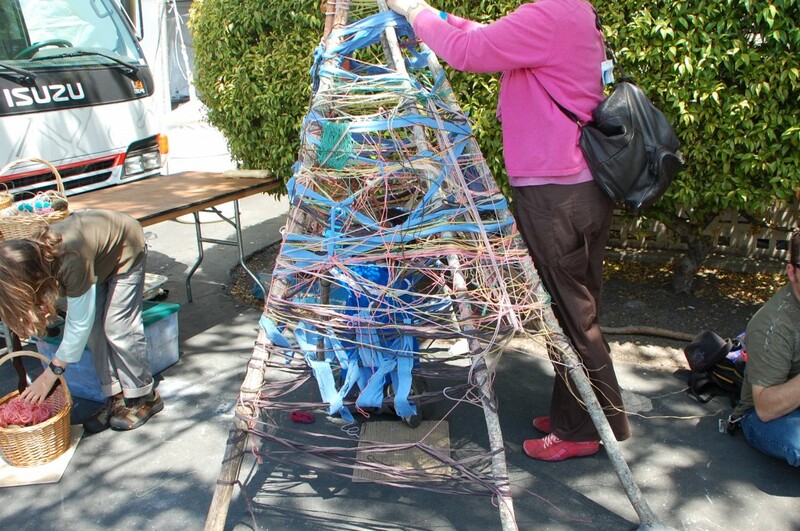 Referencing the Dougherty sculpture, kids and grown-ups weaved long strips of fabric, yarn, and ribbon through the slats of the teepee. 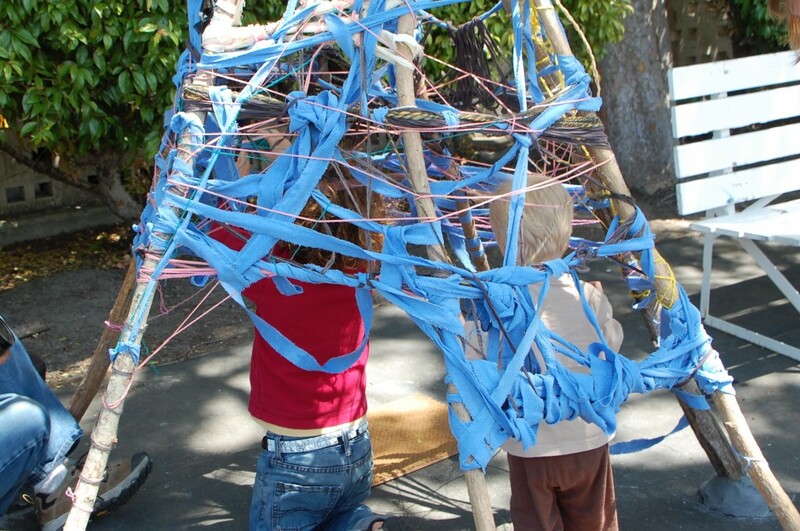 Not only were there children engaged on the outside, but they were also weaving from the inside. To give you a sense of the time involved, these teepees had been up for about three hours at this point. So again, these forts take some time. 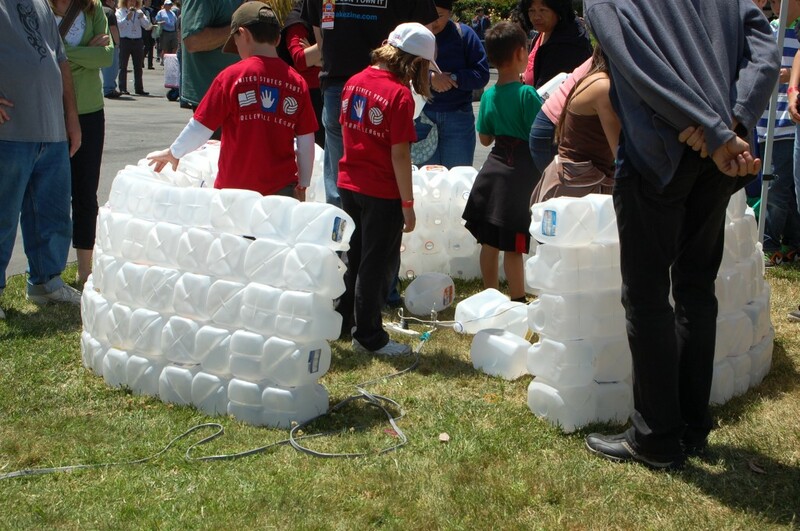 Have you or your kids built a fort? What materials did you use? Feel free to add a link or a photo in the comments. A quick image search on “Milk Jug Igloo” turns out all of these igloos! 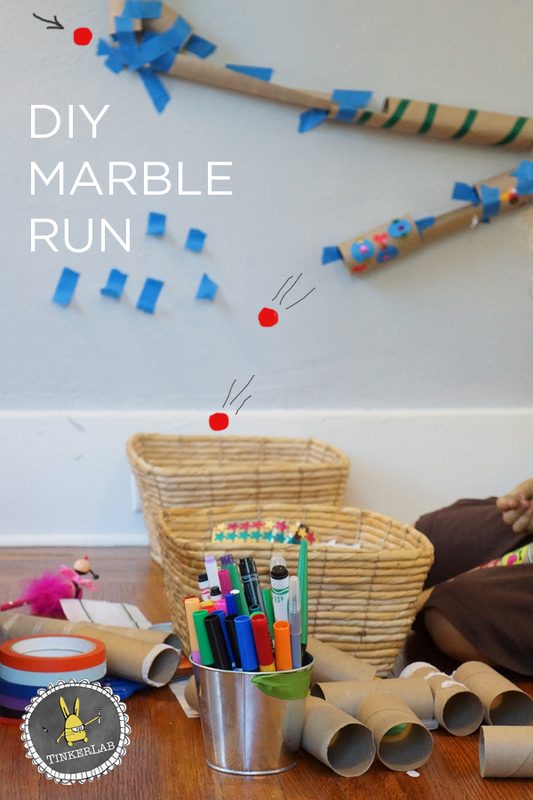 My kids have been playing with this DIY marble run all week and today I’m going to show you how to make a marble run with kids using simple, household supplies like paper rolls and tape. 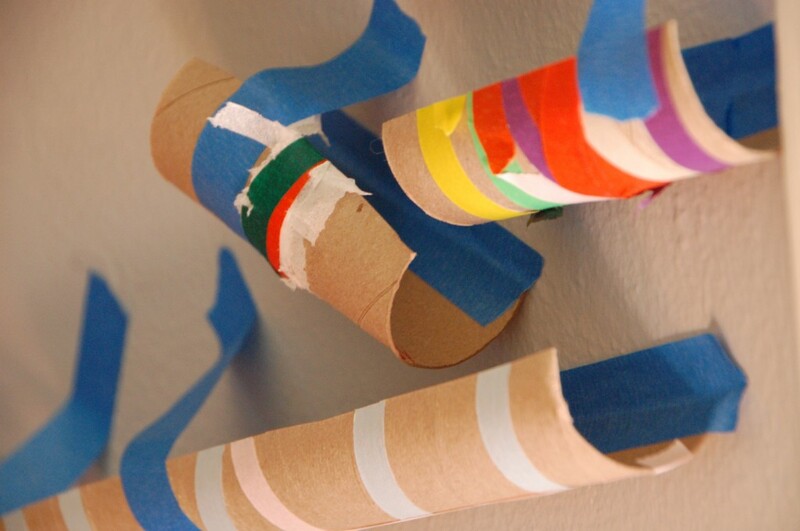 For this DIY marble run, we started by wrapping the paper towel and toilet paper rolls with colored masking tape. This step is purely decorative, but it added some pizazz to the design and kept my daughter busy for a good part of a morning. Totally worth it, in my estimation. We had fun layering and wrapping tape, selecting colors, and cutting the rolls. 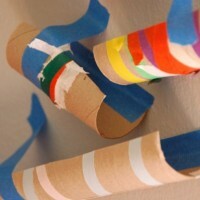 Once the rolls were appropriately covered, I took a pair of scissors and cut the tubes in half, right down the center. N thought this looked like fun so she jumped in on the cutting action too. 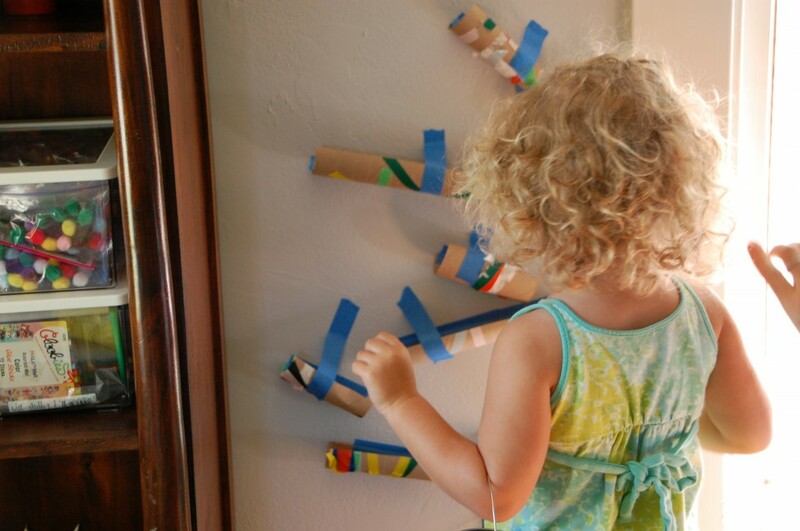 Set your marble run up on an empty wall, large window, or sliding glass door. We found some wall space, taped the highest tube to a spot that N could easily reach, and kept on taping rolls until we had something we were happy with. 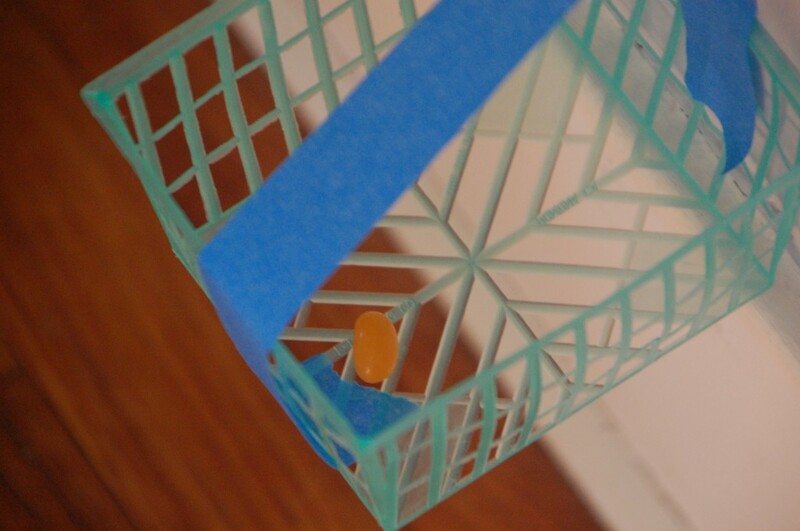 If you want to make a marble run work, it’s best to test it as you go. Marbles move fast and like to fly right out of the tubes if they’re not positioned to catch speedy marbles. We tested the sections of our DIY marble run a few times to work out the angles and distances. This is a fabulous math and physical science lesson! Once we got it to a place that seemed to work, N dropped in her marble and stood back to watch the magic happen. We needed something to catch the balls (and jellybeans! ), and a strawberry basket was just right for the job. Try rolling other objects down the chute. How do they compare to the marbles? 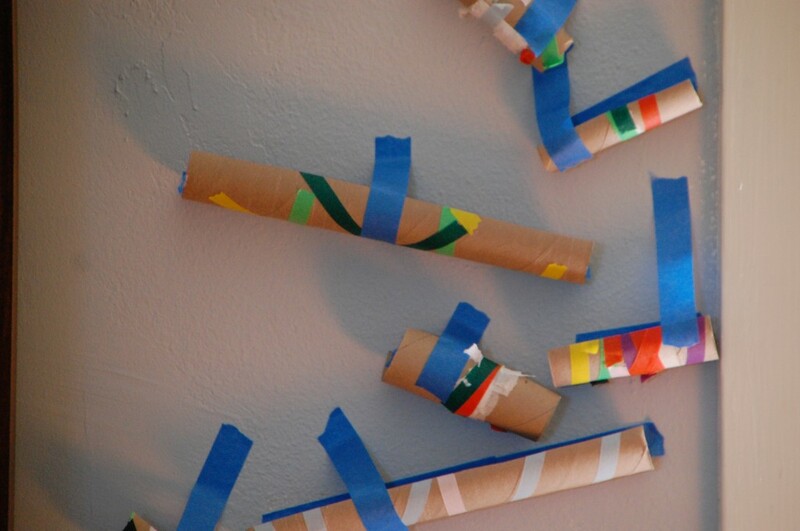 Make chutes out of other objects such as cut-up + folded cardboard boxes or folded paper. What material/s make for the best chutes? 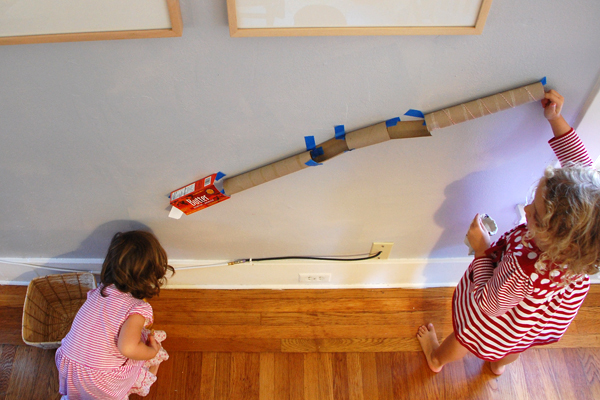 Build a marble run inside a large cardboard box.